This Is News I Need? I kid you not, I saw this on the San Francisco Chronicle's web page the other day. Yeah, and wasn't his gardener's brother's son arrested? I'll bet he knows someone who knows Kevin Bacon, too. And while I'm harping on the news, I'd just like to register my complaint about headlines that are put in the form of a question. I mean, it's supposed to be the news, not Jeopardy*. I'll take Middle East Conflicts for $500, Alex. "Will stimulus bill win over any Republicans?" "GOP Bum-Rushed by 'Voice' of Party?" 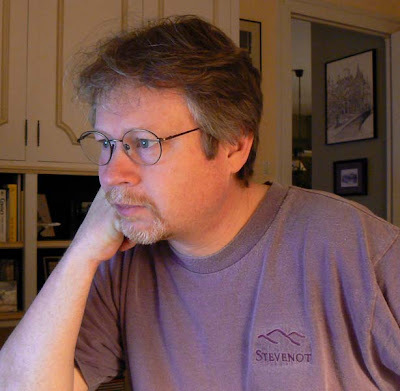 "Is Gregg a Candidate for Commerce?" "Is there something mysteriously lucky beneath David Beckham's AC Milan shorts?" I find the worst offenders to be the broadcast news shows. Often the headline-in-the-form-of-a-question is a teaser just before a commercial break to ensure you don't go far from the television set. As in, "Coming up next, will the world really end in fifteen minutes? We'll tell you, right after this..." The same tactic is used to get you to tune in to a later installment: "Be sure to watch next week's special report: Will your drinking water kill you?" Uh-oh. Better stick to wine until that comes on. "Will the green technology sector remain bullish?" "Prince Harry: Bachelor again. But why?" "Walters: Does God care who wins?" I suppose the news people think that the question mark will be our clue that what's coming next is not part of the "serious" news of the hour. Like we really need a clue that every story on myriad twenty-four/seven news channels and continuously updated internet news sites is not a late-breaking hard-news item. And don't get me started on Super Bowl ads. Thanks for listening. Coming up tomorrow, will Walt find out what's beneath David Beckham's shorts? We'll let you know, right here on wcs: another american in france. * Jeopardy is an American television game show in which the answers must be given in the form of a question. The other day a friend of ours, who lives on the other side of town, dropped by to say hello and bonne année (happy new year). We hadn't seen her in a while, so it was nice. 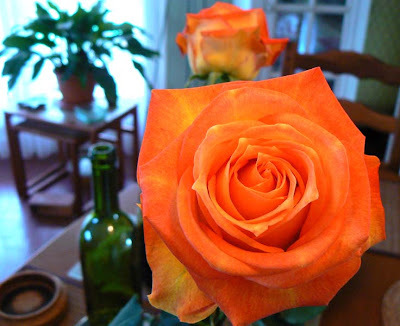 She brought us each an orange rose. They brightened up the table a bit. And they're still hanging in there nearly a week later. She also scolded us for not dropping by to see her. You see, out here in the country, people are in the habit of just dropping by for unannounced visits. And, when they do, the customary thing to do is to stop what you're doing, invite them in, and break out the bottles -- people will frequently arrive just before lunch, or just before dinner, both of which are prime times for apéritifs. And that means that you must always be prepared and have several bottles of the standard apéros on hand. They include Martini (sweet red vermouth), some kind of pastis, port, whiskey, crème de cassis (for making kirs), maybe a pineau des Charentes, and some wine. It's polite to offer your guests a small choice. Nearly every French home has this little collection of bottles at the ready for drop-in guests. But Ken and I are just not the "drop-in" types. And it really unnerves me when I'm dropped in on. It doesn't happen much, and I'm getting better about it. But still, people we know here keep telling us to just come over, drop in, any time. I still would rather call first. Or just stay home. By the way, the friend who brought the flowers just had a glass of water. She's not big on apéros, although she will have the occasional cup of tea. I think so. My last haircut was in mid-November. 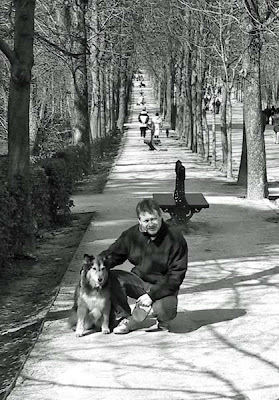 After our sandwich lunch, we drove over to Retiro Park for a walk. It was Sunday afternoon and the sun was shining. Quite a pleasant day, really, for February. I think many others thought so, too, because the park was filled with people. 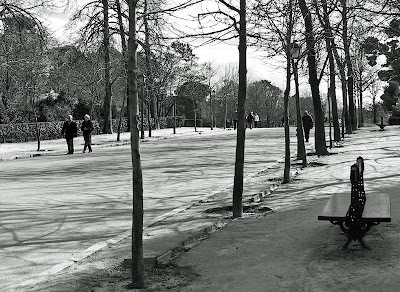 One of the large allées in Retiro Park. 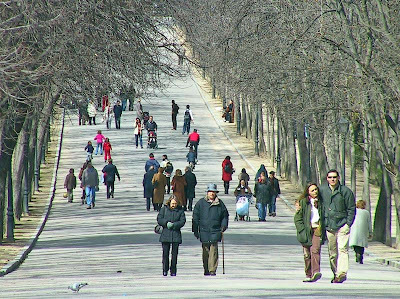 Retiro is a large park on the edge of the old city center. It's huge, includes a large rectangular lake, a botanical hot house, fountains, allées, grand parterres, and many of the other standard features of large urban parks. Inside the park, you can almost forget you're in the middle of large city. There were, of course, many children out with parents and grandparents. They were sailing boats in the fountains, watching puppet shows, lining up for treats at the food kiosks, taking pony rides, and doing all the other things that kids do. A quieter section of the park. I took some black and white pics as an experiment. There were also many dogs, so we had be very attentive to Collette on the leash and ensure that no agressive behavior happened. Collette could get very protective of us when she was on leash. But I don't remember any dog incidents, so it must have all gone very well. Looks like an angel and a snake. I'm not sure what we did that evening, but it was our last night at the hotel. The next morning, Monday, we checked out, and headed over to Sue's. We went to a neighborhood grocery and bought the fixin's for a brunch-like meal, then went back to her apartment and cooked and ate. Then we said our good-byes and left Madrid. 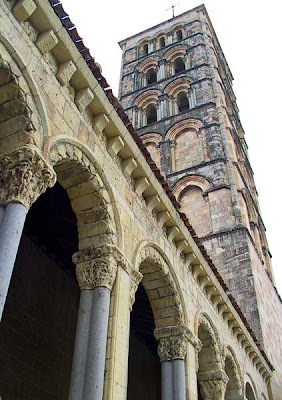 Our plan was to drive as far as St.-Jean-de-Luz, just over the French border, and spend the night there. Then we'd drive on to Saint-Aignan the following day. It was a better plan than going the whole way in one day. 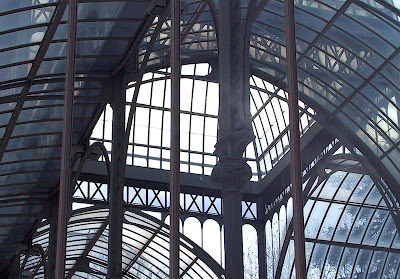 Inside the crystal palace, taken from the outside. 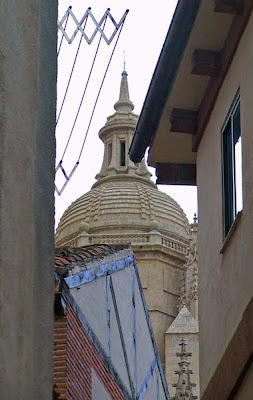 I don't have any photos from St.-Jean-de-Luz. It's a beach/resort town and very pretty, but since we were there in February, it was all very calm and many of the shops and restaurants were closed for the season. Still, we walked on the beach, found a fine restaurant, and had a good stay. Collette and me posing for our portrait. But, as always, it was good to finally get home. On our second full day in Madrid we decided to stay in town and do some walking around. We picked Sue up from her morning class and headed into the center of town. It took a little driving around but we found a place to put the car so we could walk. A funky display on the Plaza Mayor. 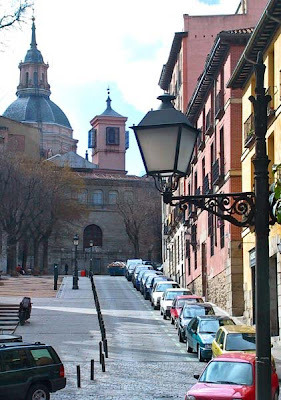 We ventured through the Plaza Mayor and through some of the small streets in the center, then around to where the royal palace is. 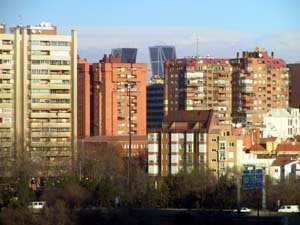 Madrid was much bigger than I had imagined with many more tall buildings than I had expected. 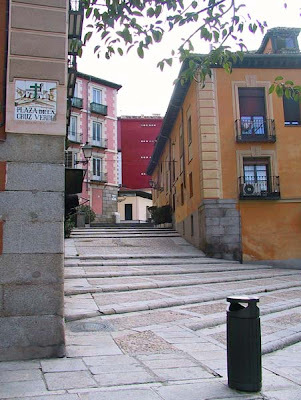 Plaza de la Cruz Verde. 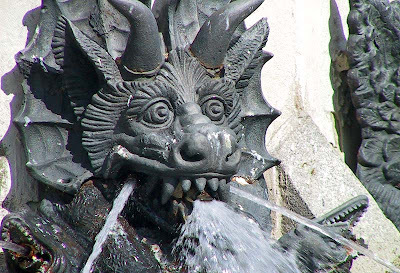 The mix of old and new, ornate and plain, and that recognizeable feel of Europe was at once familiar and strange. Most of the time I didn't know what I was looking at. 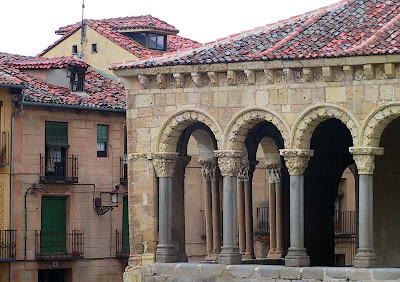 Sue knew some of the buildings and monuments and plazas, but she had only been there for a month or so, so she was still exploring as much as we were. I was able to identify some things using our map, and some of the rest on the internet after we got home. 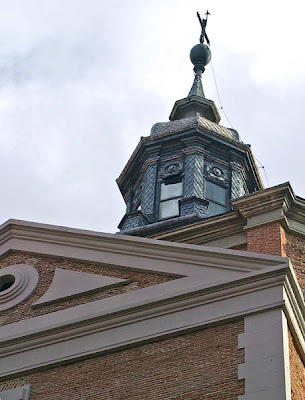 The dome of San Manuel y San Benito. Madrid has a large subway network that I didn't get to try out, even though Ken and Sue said they wouldn't mind if I went for a short ride. But I didn't. If I ever go back, I'm sure I'll have another opportunity to check out the subway. 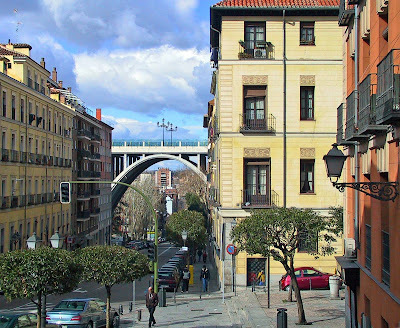 Looking down the Calle de Segovia (Segovia Street). 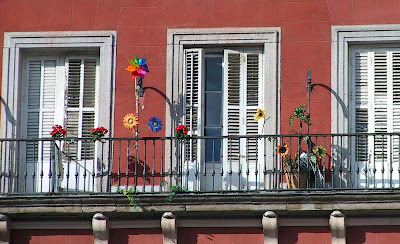 Another thing that struck me about Madrid was that many of the buildings were painted in bright colors. This is in stark contrast to France, where stone grey, white, and beige are the predominant colors. I think this is San Andrés (St. Andrew's) Church. At one point we found a grassy spot and thought Collette would enjoy the soft ground as opposed to the hard streets and sidewalks, so we took her onto the grass for a stroll. It was only after a few minutes that we saw the sign. 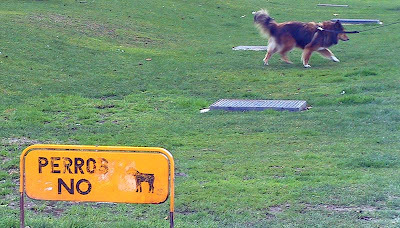 Perros No. We knew what perro meant from our lunch on the previous day, and even if we hadn't, there was a nice graphic to help us out. Oops. We got off the grass quickly. Hurry, get Collette off the grass! After a lot of wandering around, we were getting hungry for lunch, so we checked out a few places near where the car was parked. We weren't in the mood for a huge lunch, and nothing was jumping out at us. Eventually we found a little bar/sandwich shop that looked good. We put Collette in the car for a nap and went in. The Church of Santa Maria. 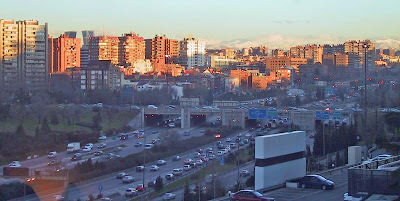 A view of central Madrid. After lunch we needed to walk some more, so we took the car over to the big center-city park called Retiro. 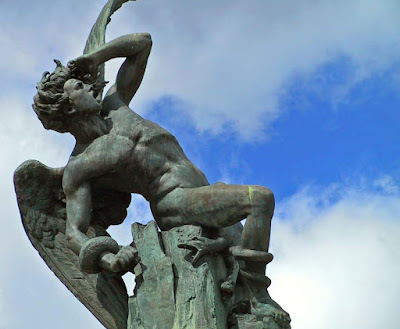 It's near where the Prado museum is, another attraction we only saw from the outside. But Collette enjoyed the park a lot. 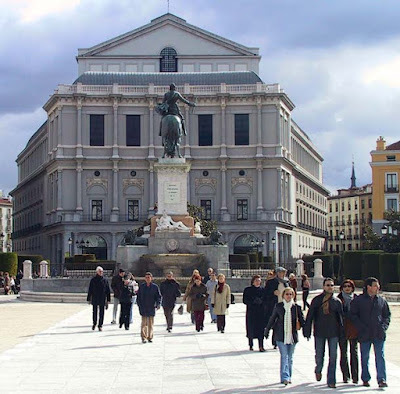 El Teatro Real, the Royal Theater, across from the Royal Palace. 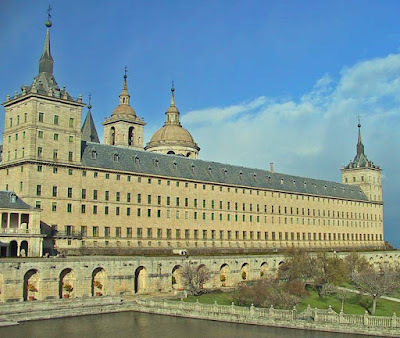 We left Segovia a short time after lunch and headed back toward Madrid with plans to stop at El Escorial on the way. 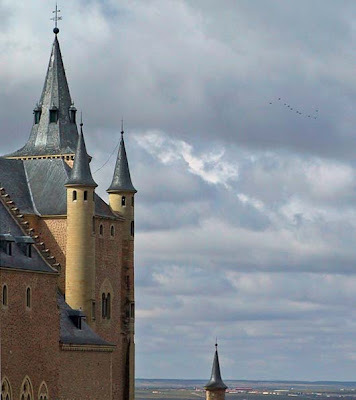 This is a pretty large complex that includes a royal palace, museum, and a monastery. 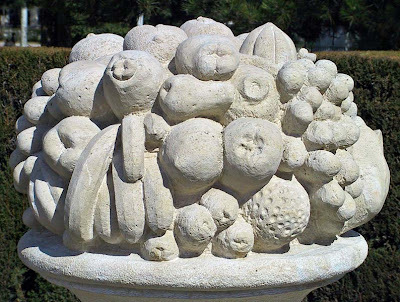 It was built in the sixteenth and seventeenth centuries. You can read more about it here. 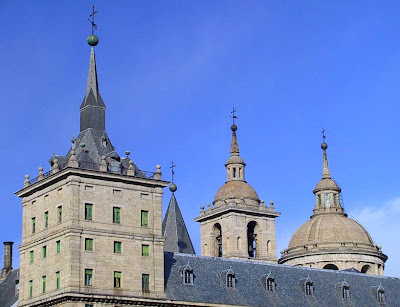 The south façade of El Escorial in the afternoon sun. Since we were operating in "drive-by tourist" mode, as I like to call it, we didn't go inside the buildings or take any of the tours. We did park and take a good walk around the exterior and took pictures. 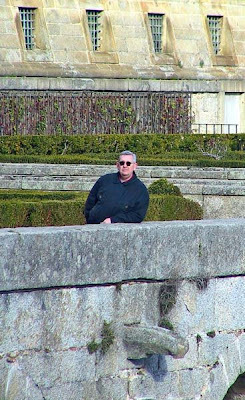 Ken poses for a picture in one of the terrace gardens. Again, it was cold, and we had the dog with us. But the upside was that the place was relatively uncrowded, and the weather was sunny and clear. We were on the south side of the mountains now and benefiting from what warmth the February sun could muster. The south-eastern corner of the terrace garden. 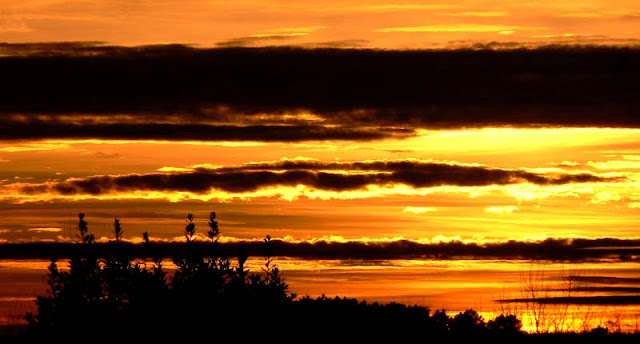 As the day drew to a close, we got back into the car and headed toward Madrid. I remember going somewhere to get take-out food which we ate back at the hotel room with Sue. Then one of us (Ken, I think) drove her back to her apartment. The next day we planned to stay in Madrid and wander around. 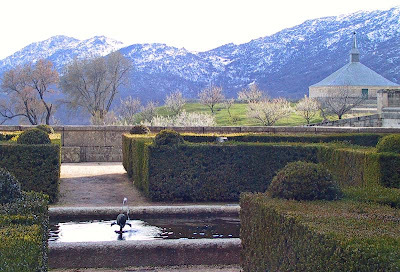 Snow on the mountains above El Escorial. 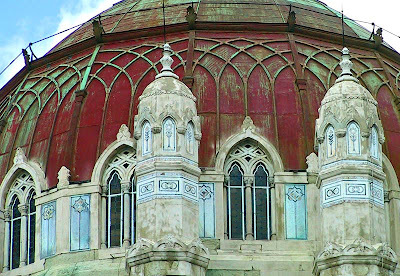 And just for fun, below, a close-up of the spires. After trying and rejecting (or being rejected by) several eateries, we just gave up. As we walked back toward Sue's apartment, we passed a very small restaurant on a side street. The lights were on, there was man behind the bar, but the six or so tables inside were empty. Rush hour traffic builds in Madrid. Segovia is just beyond the mountains in the background. We ducked in and asked the man (with Sue's help in Spanish) if we could get something to eat and if he'd allow Collette in, too. 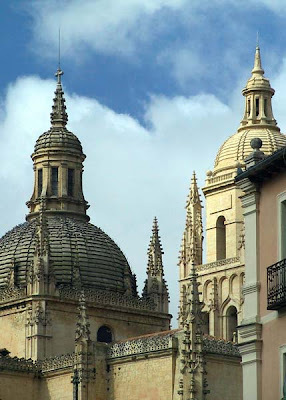 He said that he normally wouldn't let the dog in, but since there were no other customers it would be ok.
Domes on the Segovia cathedral. After getting situated and getting some wine, we asked him for something to eat, I'm not sure what. We tried to decipher the menu. He said he'd make us up something. Again, I'm not sure what. We watched him work behind the bar and a few minutes later he brought a large platter of cold meats and cheeses and some bread. It was incredibly good and we ate well. Then it was back to the hotel and bedtime. We were, as the British say, knackered. The cathedral, seen from near the alcazar (castle). 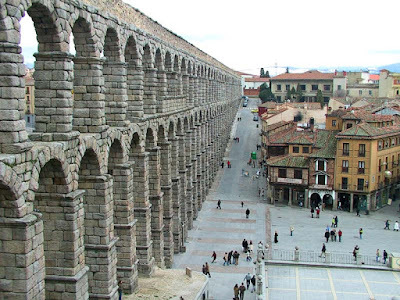 If I remember correctly, we planned a day trip for the following day to Segovia, which is a small city north of Madrid, and boasts an alcazar, cathedral, and an old Roman aqueduct. It's a very picturesque city and is, consequently, a great magnet for tourists. Like us. We drove over and actually found a parking spot in the old town - this was February after all - and started walking around to get the lay of the place. Then it started to snow lightly. Did I mention that it was cold? We walked and walked, did some shopping, and took lots of pictures. We took turns holding the dog's leash so the other could snap photos. Arches in the old town. We strolled around the cathedral, the alcazar, and some other interesting sights, but we didn't venture into any of them. Mostly because we had the dog and she would not be allowed on the tours. So, rather than one of us staying behind with Collette, we decided to just be exterior tourists on this trip. After a while in the upper town, we decided to look for a small place for lunch. We drove down by the aqueduct and found another parking spot. This time we left Collette in the car to nap (she was very used to this and didn't mind at all) and set out to find a place to eat. We were obviously in a very touristy area. We could tell by the style of restaurants. The hundreds of souvenir shops lining the streets were also a clue. Not to mention the tourists milling about. But, since we were tourists ourselves, we blended right in. Looking down from the alcazar. It didn't take long to find a restaurant (eenie, meeny, miney, moe) that served an approximation of paëlla (all tourists want to eat paëlla in Spain and we were no exception). It was ok, but I've had better paëlla in France. Obviously we were not eating in the right place for paëlla. But it didn't matter. It was edible, warm, and we were having a good time. After the meal, we all had some little bits and pieces left over and we wanted to take them with us for Collette. 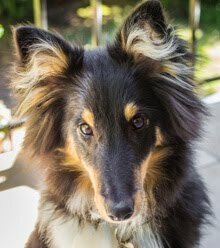 Sue wasn't sure her Spanish skills could handle such a request, so Ken asked what the word for "dog" is, and Sue said "Perro. I think." When the waitress came to clear the table, Ken pointed to his plate and said, "Perro?" 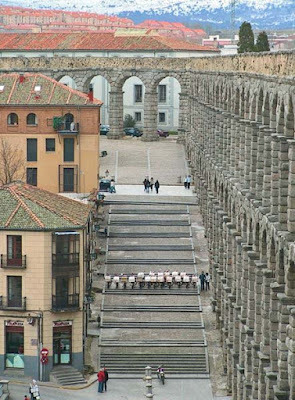 The aqueduct and a line of pizza delivery bikes. By the look on the waitress' face, it was clear she thought Ken was asking if we just ate dog. With a lot of laughing and waving of hands, he got the message across that we wanted to take the leftovers for our dog, and she quickly brought out a Styrofoam container. We thanked her profusely, scooped up the leftovers and made our way back to the car. Collette appreciated her reward for being a good dog. All's well that ends well. We ate our lunch off to the right of this photo. I mentioned yesterday that we hit snow on the way to Madrid. The trip started easily enough. We left the house just before sunrise and headed southwest to meet up with the A-10 autoroute near Châtellerault. We did that to save a bit on the very pricey tolls in France. 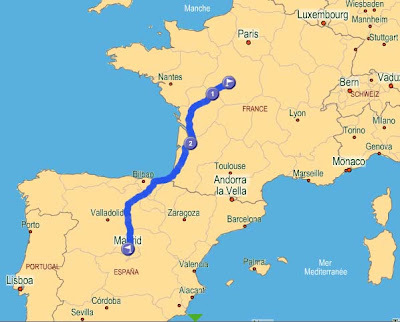 From central France to central Spain: our route. We stopped at a rest stop to eat some lunch we had prepared for the trip and to give Collette a chance to get out of the car. As we headed on south toward Bordeaux, it started to snow. Ken was suffering a major allergy attack in the car and was miserable. The snow was light, so we didn't think anything of it. 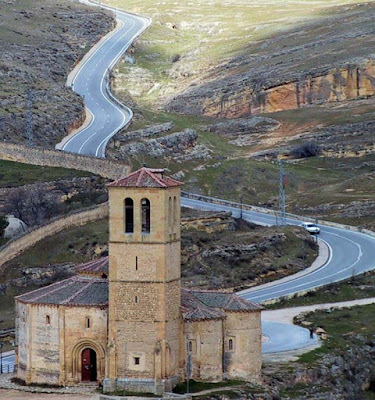 As we got around Bordeaux and continued toward the Spanish border, we heard on the radio that the mountain passes were becoming hard to navigate due to snow and that trucks were being stopped at the border. Cars could go on through, though, so we figured we'd be ok.
Part of the Madrid skyline from our hotel room. As we got up into the mountains after San Sebastian, the snow got worse and worse. It was very difficult to see, nearly white-out conditions. Then the traffic came to a halt. There we were, tired, with a dog in the back seat, frantically tuning the radio but unable to come up with a station in French. Neither of us speaks Spanish. We had no idea what was going on. We thought, at one point, that we might be spending the night in the car. Ça commence bien (this is starting off well), we said. Another shot from the room. The traffic did start moving again after a while and we debated turning around at the next exit and heading back into France. One of us wanted to go back and the other wanted to press on. I won't give away who held which position. But as we debated, we just kept going. Traffic was moving very slowly, and stopped at times for fifteen minutes to a half hour. After a while, it felt like we were going downhill, so we figured we had made it over the pass. Why go back? Eventually we made it down out of the mountains and the snow was behind us. We sped our way southwards toward Madrid, realizing that because of our delay it would be dark before we arrived. I think we pulled in around nine p.m. or so, found the hotel, and got checked in. Sue had called the hotel a couple of times before we got there. Since she didn't have a phone in her apartment, she had to go out to a phone booth to call each time. We had no way to call her back to let her know we made it. 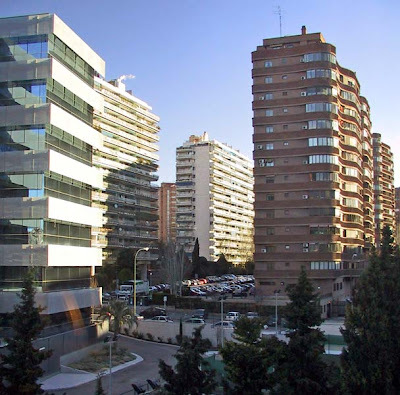 Our hotel's neighborhood, a mix of offices and apartment buildings. We decided to go to her apartment. We knew where it was, at least on the map; it was about a five minute drive from the hotel. Of course, we proceeded to get lost in a maze of one-way thoroughfares and back streets and went in circles for a while. Street signs, if they were there, were well hidden or invisible. I took to looking for subway entrances to figure out where we were. It was dark, after all, and asking for directions was not an option. But again, we made our way there and circled the neighborhood a few times before we found a parking space a few blocks away from Sue's building. I think it was around eleven when we finally rang Sue's bell. She let me in while Ken stayed on the street with Collette. She was in her nightgown and nearly asleep, but she was a good sport and got dressed and came out for a late walk with us while we told her of our snowy adventure. We looked for a place to eat. It was prime time for Madrid restaurants - the Spanish eat very late - and places looked crowded and lively. We hadn't eaten since lunch and were hungry. We soon found out that the Spanish don't generally let dogs in restaurants like the French do. It was too cold to get some take out and eat outdoors. And Sue's American roommates would not have appreciated a dog in the apartment, especially at midnight. What to do? I've never been to Oklahoma. But I have been to Spain. Once. 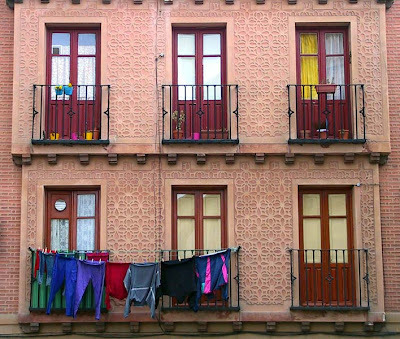 Five years ago, our friend Sue spent a few months in Madrid. In February 2004 Ken and I drove down from central France to visit her for a few days. I thought I'd post a few photos from that trip. 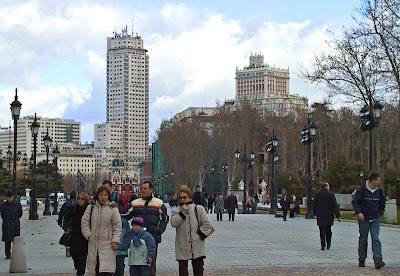 We stayed at the Madrid Novotel because, it being a French hotel chain, we knew they would take dogs. We had Collette (our first dog) with us. They made us feel welcome and comfortable. On the way, we drove through an incredible snowstorm. At one point, in the mountains between France and Spain, we thought we might have to turn around and go back. The freeway was blocked. We were experiencing white-out conditions. But we persevered and got through to the other side and made it down to Madrid. We got there very late, close to midnight, but we got there. So the next few posts will contain some of the pictures I took on that trip. 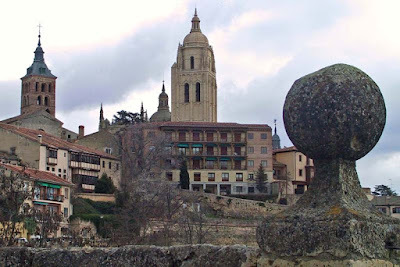 This one is from Segovia, where we spent a very cold February afternoon. 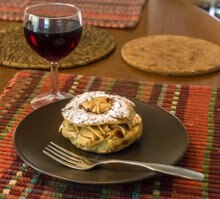 I made a pâte feuilletée (flaky pastry) yesterday, just on a whim. I made enough to do more than one thing with it. 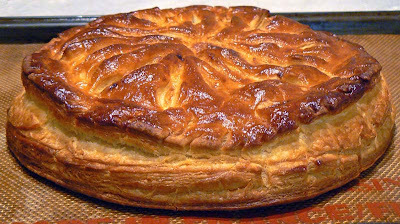 So, the first thing was a traditional galette des rois. And here it is. There is a fève inside! And frangipane, of course. I saved half the dough for something else. Maybe a tourte, mabye something else. I'll let you know. Some of you may know that, in France, you can tell which administrative department a car is registered in by looking at its plaque d'immatriculation (license plate). The last two numbers on the plate are the department's number. It's similar to state license plates in the US, without all the colors and logos and things. 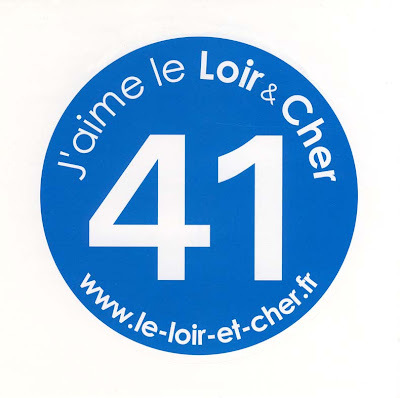 Our department is the Loir-et-Cher, 41. But starting this year, France has eliminated that practice. License plates will stay with their cars, regardless of which department they're registered in. It's a big change. Imagine if you had California plates on your car but lived in New York. And your next-door neighbor's plates said Tennessee on them. And as the fleet changes over time, the department numbers will disappear altogether. To counter this move, some administrative departments, like ours, have sent out bumper stickers (above) with the department number on them. That way, you can show the world where you really live, even if your license plate says something else. 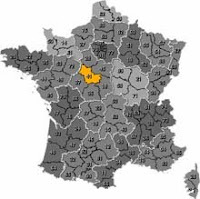 Le Loir et Cher is highlighted on this map. 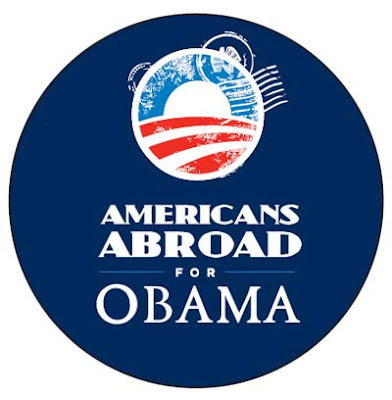 Until we buy a new car with a different numbered plate, we won't be needing this sticker. Maybe one day? Will we care? The sunsets we get in January are really cool. Other times of the year, too, but there's something wonderful about January sunsets. Good thing, too, because January gives me cabin fever. I do get out once a day with the dog, but every time I look out the window I'm reminded of how much there is to do in the yard. And I'm not out there because it's too cold or too wet. I suppose I could be brave and get out there anyway, but if it's a choice between tennis on t.v. and cold or muddy yard work, well. And then there's lunch to make and eat. So I will continue to wait for the perfect combination of timing, motivation, and weather. And I will continue to complain about it, no doubt. I couldn't wait. My old hiking boots not only developed holes in the uppers making for soggy socks, but the rubber sole on one of them cracked wide open. That's not a good thing when you're trodding through the vineyard in slush and mud. So we drove up to Blois the other day to check out two sporting goods stores. The first, a Décathlon, was picked pretty clean. This is one of two annual sale times in France and a lot of merchandise is marked down. The sale started over a week ago. The second store, Go Sport, wasn't much better, but we both found something we liked, that fit, and that was marked down by a good amount. So I say good-bye to a comfy old pair of boots that have served me well for close to ten years. Now I'm in the break-in period with the new pair. I already have a band-aid on my right heel. We also stopped at two other stores along the way, one of which was the Paris Store where we buy Asian food products. Lots of beans, grains, noodles, and frozen raw shrimp. And we got home in time for lunch. It was a productive trip. I made a second batch of Finnish/Swedish meatballs a few days ago. I made them a bit smaller than the first batch. We ended up with just under seventy meatballs. Of course, we didn't eat them all in one sitting. 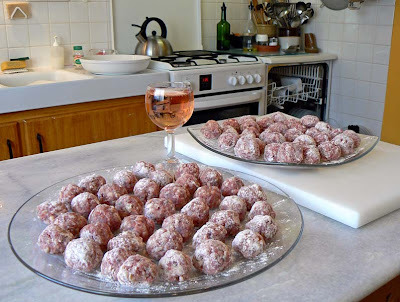 Raw meatballs, pork and beef. This time we simmered them a smokey broth that came from blanching a piece of smoked pork mixed with the leftover simmering liquid from the first batch. That was mostly chicken stock, if I remember. 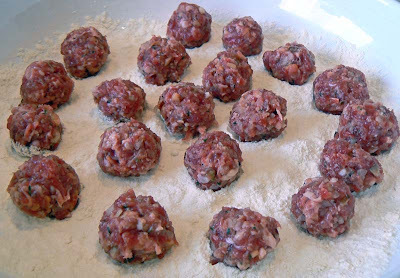 All the meatballs, dredged in flour, ready to be browned. Then Ken made a darker gravy that we served along side. We also made up a batch of "dirty rice" which is rice cooked with stock instead of water. It was all very tasty. 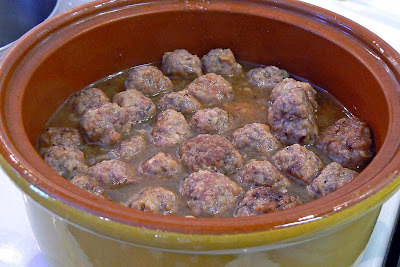 The cooked meatballs in their broth.